I have been admiring the Cherrywood challenges and their beautiful fabric for a few years. 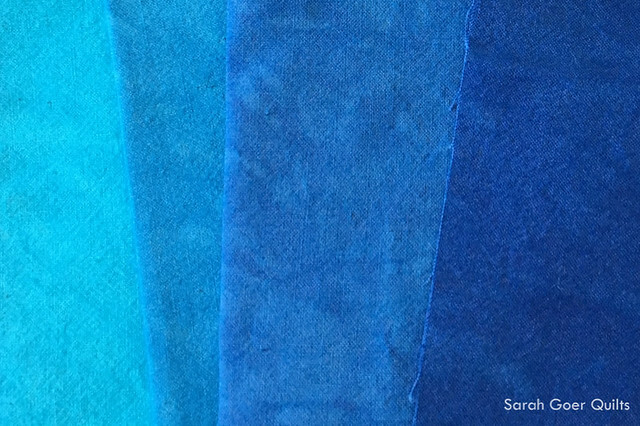 If you haven't seen it, the fabric has a beautiful suede-like look, though it is 100% cotton. Their first challenge was the Wicked challenge, announced in early 2014. My friend Mel participated (way back before we really knew each other) and it was so fun to see her quilt and the others when they were on display at PIQF. 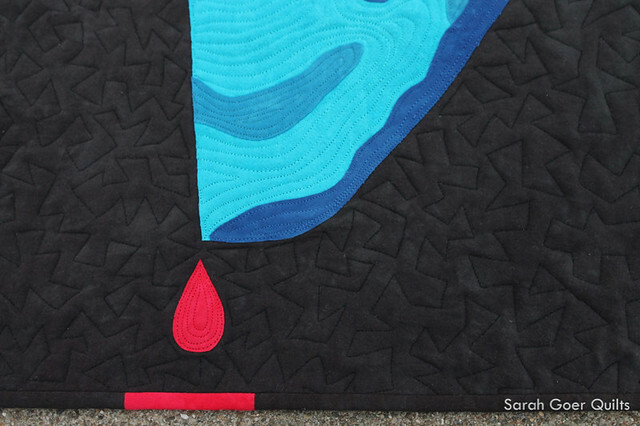 Her wicked awesome quilt was one of 27 finalists (of the 114 submitted). Be sure to look closely at her amazing quilting. And here are all the quilts. Fast forward to last year. Cherrywood's second challenge had a Lion King theme. The palette was golds and black... and I have to say I wasn't super inspired by the theme or the colors and did not participate. But the quilters that participated did not disappoint! The Lion King Challenge received 304 entries and 120 were chosen for the traveling exhibit which is coming to PIQF in October. When they announced the 2017 challenge theme, Van Gogh, and the beautiful palette of blues (with black), I knew I wanted to participate. I warmed up my quilt challenge mojo in January-March with six weekly challenges in twelve weeks. After that intense schedule, any quilt challenge seemed doable so I picked up a Cherrywood challenge fabric pack. The challenge required 75% of the quilt top to be form the challenge palette, but we could add any other Cherrywood fabric (or solid white from elsewhere) to the quilt top. The quilts must finish at 20" x 20". I'm a procrastinator. I rarely miss a deadline, but sometimes I need that deadline to be rapidly approaching to kick myself into gear. So that happened with this challenge. The deadline for online submission was August 1. I happened to have a week long family vacation with my husband's family July 23-28. Naturally, I hadn't started my quilt yet, and I didn't even have a plan. However, my niece and nephew wanted to learn how to sew so I was bringing my sewing machine on vacation. I packed my challenge fabric and hoped I'd come home with a finished quilt top, leaving me a few days to quilt and bind it. Yeah, so that didn't happen. This is as far as I got on vacation. I have to say that I was really having a hard time deciding what to do for my project. I love Starry Night, but I didn't want to go that way with my piece for a couple of reasons. I assumed there would be a lot of Starry Night inspired pieces (which there are, and many of them are amazing!) and I was struggling with how to use Starry Night as an inspiration and have it also reflect my personal style. And I couldn't get away from the fact that I'd somehow have to represent brush strokes in fabric. For a while I considered cutting out a lot of little pieces to applique brush strokes, but I just wasn't feeling it. 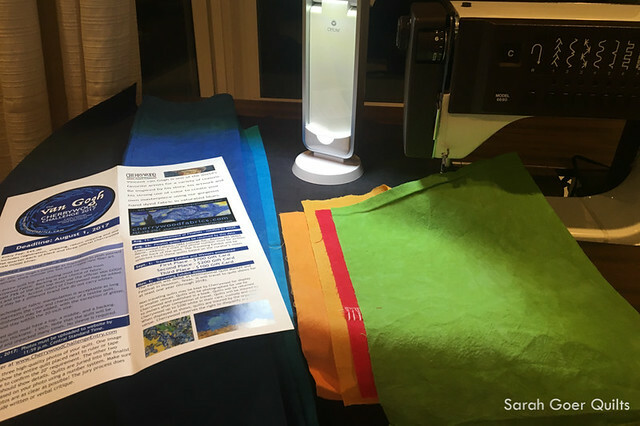 Struggling with quilter's block, I shared with my family about what the quilt challenge entailed. In explaining how the challenge worked, I shared that I would love to have my quilt included in the traveling exhibit. We discussed how difficult it seemed it might be to stand out with a Starry Night themed quilt and I joked that the traveling exhibit would certainly include a "bloody ear quilt." Cause really, how does someone not do that? At some point I started seriously considering an ear quilt. I read a lot about Van Gogh and hadn't realized there were conflicting stories about the incident, including how much ear was actually cut off. I stumbled upon this book. Eventually I decided I would focused on the fact that everyone knows about Van Gogh, he cut off his own ear. Then I needed to figure out how I would do it. Here's part of the struggle of this challenge for me. I don't really love the process of applique. I was drawn to quilting 15 years ago because of the geometry. I've done a little applique, but I generally try to avoid it. 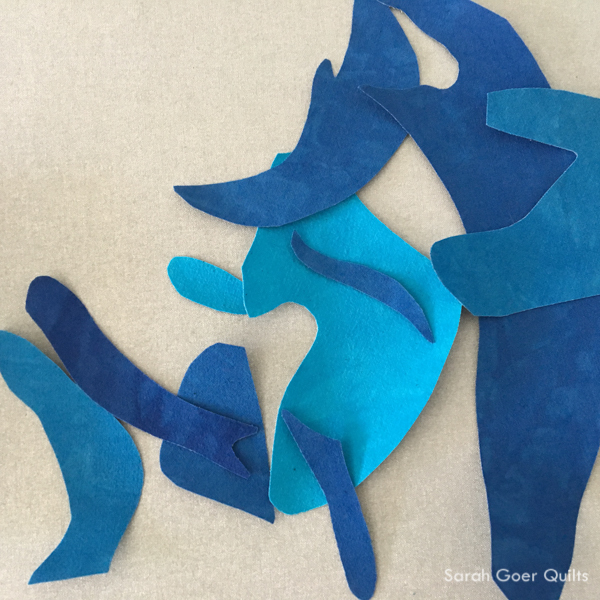 I don't really enjoy hand work (due mostly to the fact that I work on a million projects at a time, so I don't have the time to devote to a hand sewn project) and I think of applique as hard. Well, a couple things have happened recently to somewhat change my mind on the matter. First, the first block my daughter received in the Kids Quilt Round Robin was all applique. Sure, we could have made another style block, but the Heat & Bond Lite was included in case we wanted to applique. So, why not? That block went well and wasn't really scary at all. 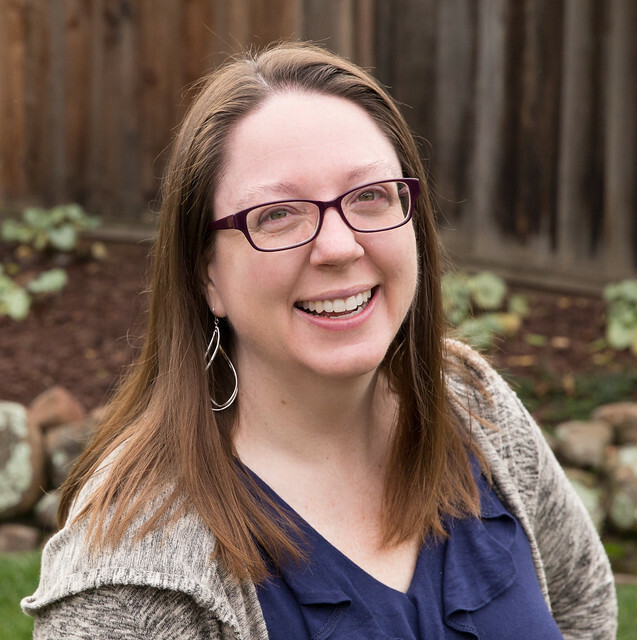 The other thing was hearing Lynne Pillus speak about her process at a recent guild meeting. She works in realistic applique from photos of interesting machinery (and other things). She shared how she uses the values in the photo to create her pattern pieces and she arranges her fabric by value, mostly disregarding color. I was unable to take her workshop, but I used what she taught us during her lecture to roughly apply her technique to my ear quilt. I added one darker value of blue to the palette to give me four different values to work with. 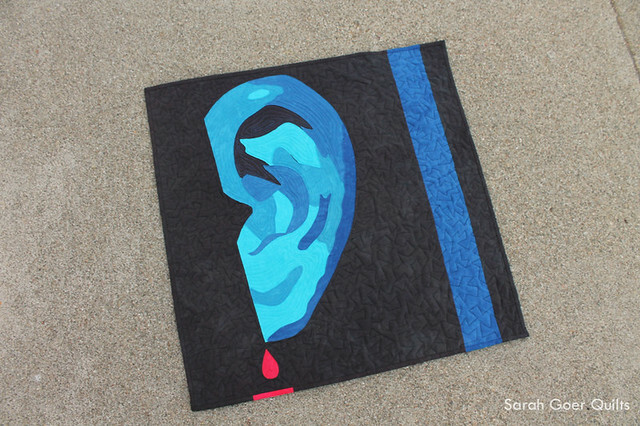 Then I printed my ear picture (in reverse) actual size for the quilt. Next, I drew outlines on the different values I saw and decided on my color/value placement. 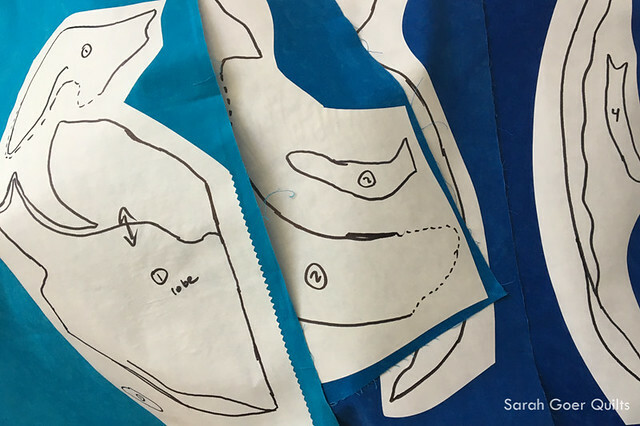 I traced by pattern onto the paper side of Heat & Bond Lite and fused to my fabric. Once all my layers were fused in place I used the quilting to hold it all down permanently. 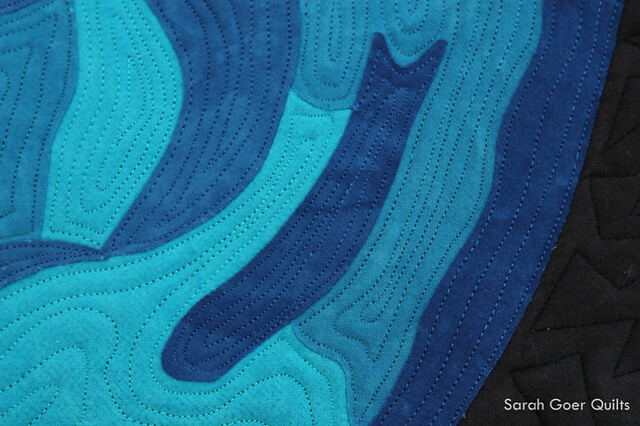 I chose to do contour quilting of the ear with a jagged background quilting motif. 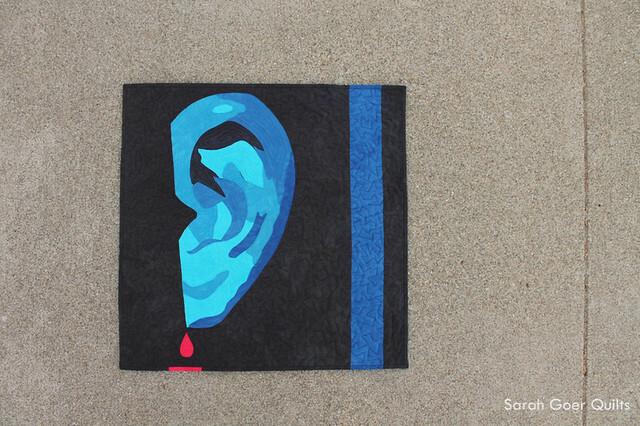 I lovingly referred to the project as "the bloody ear quilt" as I worked on it. I was never going for gory and chose a single drop of blood. I later added the red section of binding after deciding it needed a little more than the drop. I contacted local friends who participated in the challenge, Sheila and Mel, and was able to get their extra black fabric which allowed me to bind the piece in black. There were 465 submissions for the challenge. I've probably seen a few dozen shared online. Today they will announce the juried first round of finalists. I'm excited to see the list of finalists, and to see more of the quilts. I especially look forward to seeing the traveling exhibit in person. Update (8/11/17, 8:20am): I've just learned that my quilt was not selected to be a finalist. Congratulations to everyone who participated! 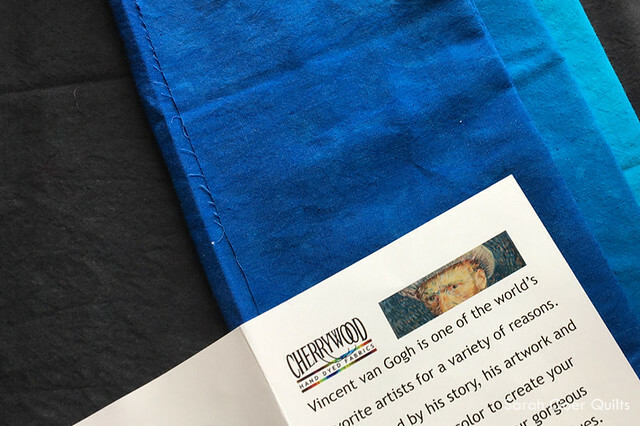 If you want to participate in the next Cherrywood challenge you can already pre-order the 2018 challenge fabrics (theme and colors to be revealed in November). I've linked up to TGIFF and Needle and Thread Thursday. Posted in Quilting. Tags: applique quilting, Cherrywood Challenge, finished quilt, quilt challenge, Van Gogh Challenge on August 11, 2017 by sarah. 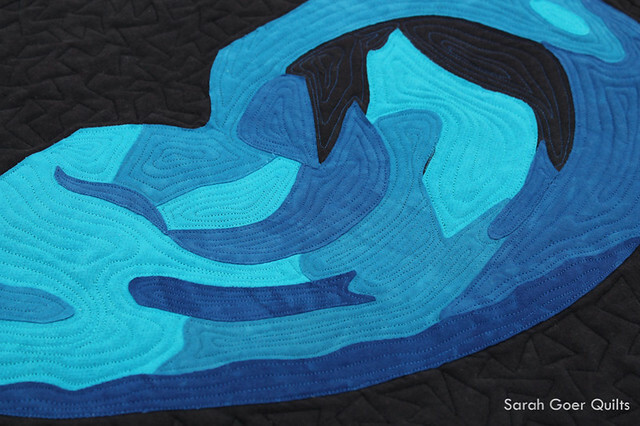 Oh my goodness, Sarah, this quilt is stunning, and your post is so informative. I will definitely have to look at it again. I created a new board on my Pinterest account called Quilting Challenges just so I can easily access this blog post again. I love learning about your creative process regarding Vincent's Ear. Your work continues to amaze and inspire me! Take care, Mary. Thank you, Mary! I'm really pleased that I was able to make my vision a reality. I'm glad you enjoyed the post. Amazing job and so creative! I LOVE IT! Seriously a great interpretation of the challenge, and a very original one. I hope it makes it in! Wow, Sarah, I would have never guessed this is where you were headed with the quilt from the sneak peeks you shared! I think that it is a really clever idea that was well executed. I especially appreciate the sharp, angular quilting in the black, now, and the extra touch of red in the binding really works. Good luck! Amazing! Too bad you didn't make it in. I think it is clever and very well done. Thanks for sharing with TGIFF. Thank you, Cynthia. Thank you for hosting this week! It's really wonderful. It is certainly another case where art cannot be narrowly bounded. I'll look forward to seeing the other quilts but in any case I'm glad that you are pleased with the results. Thank you, Lisa. There were so many ways to interpret this challenge. That's part of the fun! I love this quilt, the design, the applique, and the quilting. It is stunning. Thank you so much, Cheryl. The kind feedback I've received from everyone who has commented is very much appreciated.